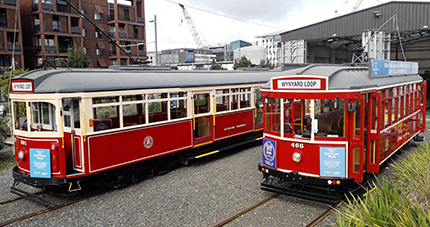 Experience the revitalised and environmentally sustainable Wynyard Quarter development on Auckland’s vibrant waterfront by getting off at tram stop one, Halsey Street. The Wynyard Quarter features a range of public open spaces to provide a variety of entertaining experiences, essential information and sightseeing for all the family. This vast public plaza offers seating, relaxing open spaces, art and steps down to the water’s edge. Right alongside a working fishing wharf, it’s the gateway to the Auckland waterfront. Find out all you need to know at the Container Wayfinding Kiosk. The Kiosk is a central hub of vital tourism information, including details about tours, where to dine, worthwhile attractions and future developments in the area. From the Karanga Plaza, make your way across the bridge to Te Wero Island, where you will find more cafes and restaurants of the Viaduct Harbour precinct. Discover the huge variety of events on offer or check out stunning views of Waitemata Harbour from the public viewing platform. Alongside North Wharf, tree-lined Jellicoe Street is famous for the freshest seafood in Auckland at the Auckland Fish Market. Enjoy a stroll down the leafy boulevard; a sanctuary in the busy city, Jellicoe Street also boasts a eclectic mix of cafes and restaurants. Historically, Wynyard Quarter has been an area for port-related industry. In more recent years the marine industry has also established a presence there to service the port and Westhaven Marina, the largest marina in the southern hemisphere. Waterfront Auckland has been redeveloping the heart of Auckland City in time for the 2011 Rugby World Cup. A stretch of approximately eight kilometres of waterfront property has been revitalised for everyone to enjoy. 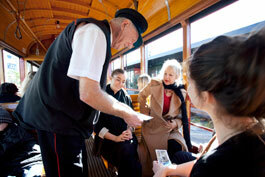 Click here to read about the four stops on the Auckland Dockline Tram route. 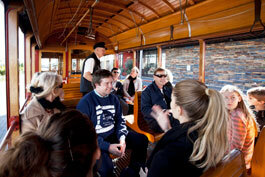 Read about the history of trams in Auckland, and information on the Auckland Dockline Tram fleet.